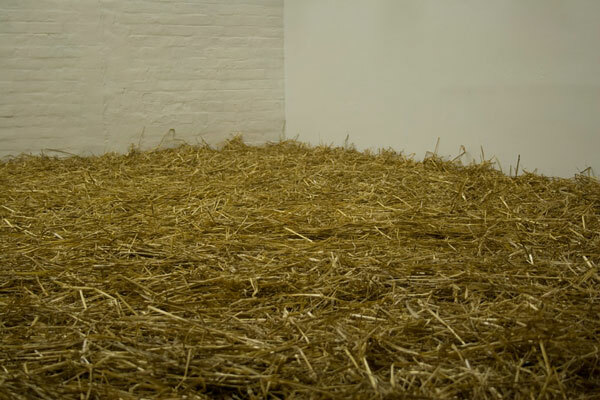 Shea Hembrey's explorations into nesting in sculptures, video projection, installations, paintings, drawings, and printmaking. Installation filling up the lower portion of the gallery and viewed from above through windows on the second floor. 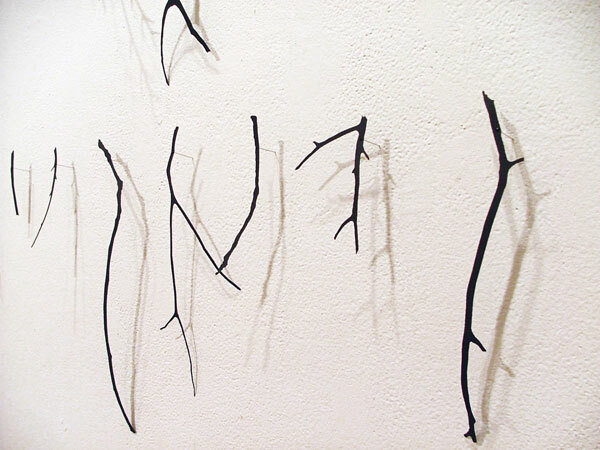 Installation of cut black paper with each piece documenting a specific stick from a disassembled mockingbird nest. The paper pieces are evenly rowed on the ends of pins coming out of the wall. Many of the paper pieces — those in close proximity to the corner and of dimensions most commonly used in nest construction—have been taken from the wall for construction of a new nest high in the gallery corner. 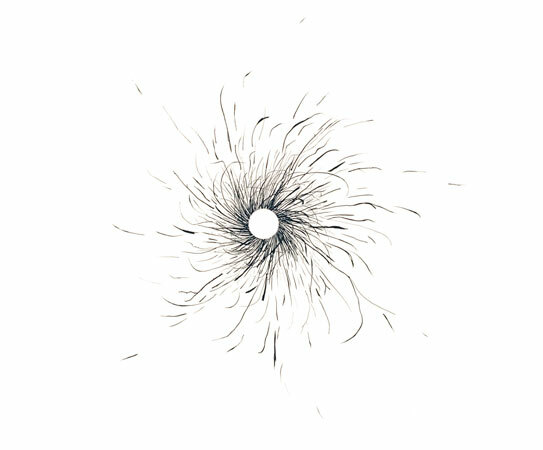 Video of a mockingbird nest being taken apart and built: an endless looping of assembly—disassembly—assembly—disassembly with each portion of this cycle subtly transitioning into the next. 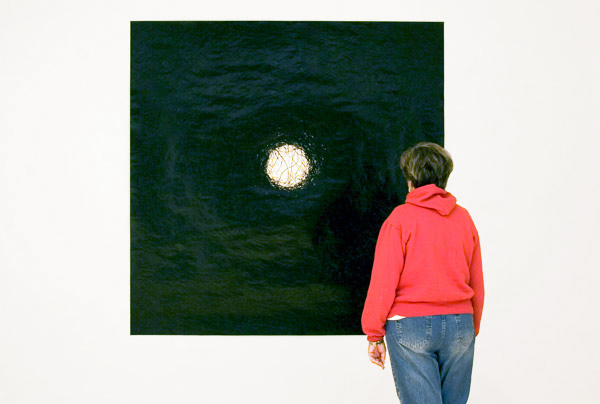 Installation of a long piece of transparent tape with both ends of the tape meeting at a hatched mockingbird egg fragment centered at 60" on the gallery wall. 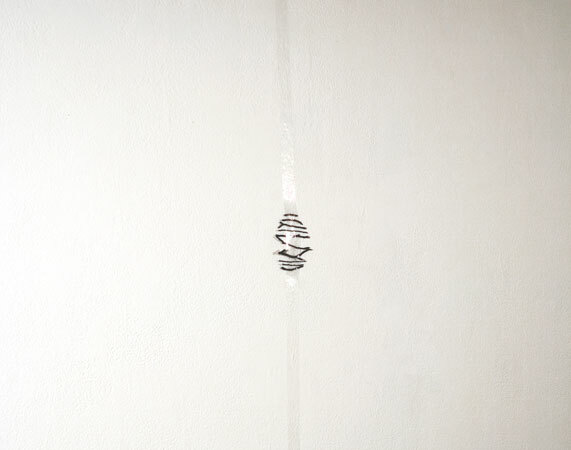 The tape runs up the wall from the eggshell and across the ceiling then down the opposite wall where it supports (again at 60") the ten smallest twigs from a disassembled nest before continuing down and across the floor and back up the gallery wall. Painting of one disassembled mockingbird nest. Woven nest made of cut paper letters spelling out a line from the opera Carmen: "love is a wild bird that no man can tame." Nests from Jackson County, Arkansas on local sandstone from Tompkins County, New York. 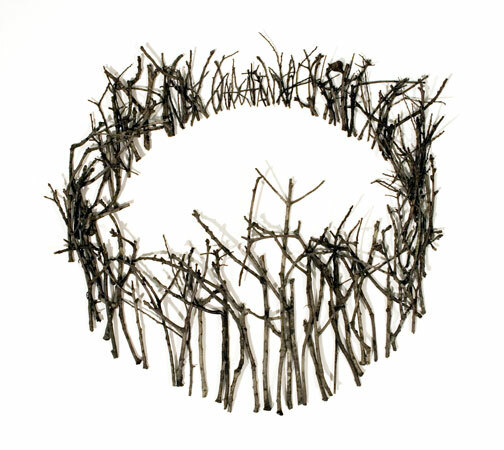 Cut paper pieces documenting the twigs from a single mockingbird nest. Painting of a disassembled vireo nest. 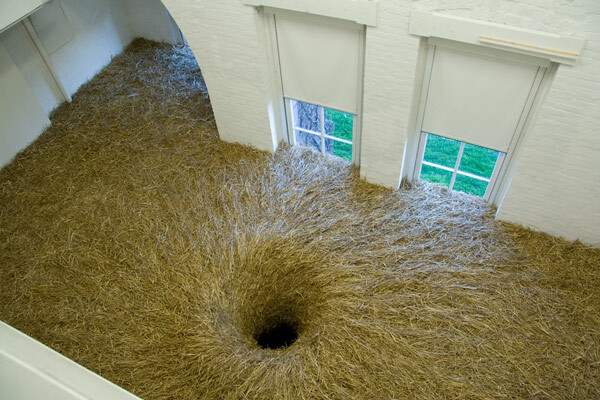 The center void corresponds to the space occupied by the original intact nest's cavity while the ink provides a temporary mapping of the space occupied by each stick and grass fragment. Arrangement of all the twigs from one mockingbird nest.